If you grew up in the late 1990s, then you probably remember boba as being a food trend from your childhood. Two decades later, this sweet treat still shows no signs of dissipating. In fact, boba cafés are still popular hangout spots in many cities all over the U.S. Though boba tea didn’t reach mainstream status in the states until the ’90s, its origins can actually be traced back to 1980s Taiwan. There are numerous variations of this sweet, tea-based beverage, but they’re all easily recognized by the large, colorful tapioca balls that float inside the drink. The beverage itself may be a tea or juice and is commonly referred to as boba tea, bubble tea, or pearl milk tea. If you’ve never tasted it, it’s best to start with a basic boba milk tea or opt for a flavor that you’re especially partial to, like strawberry or coconut. Curious to know what’s inside a cup of boba tea? Read on to learn more about this trendy treat. Though various boba drinks are available, the most common concoction includes a tea base that’s combined with milk or fruit and is usually prepared over a bed of sweet boba pearls. 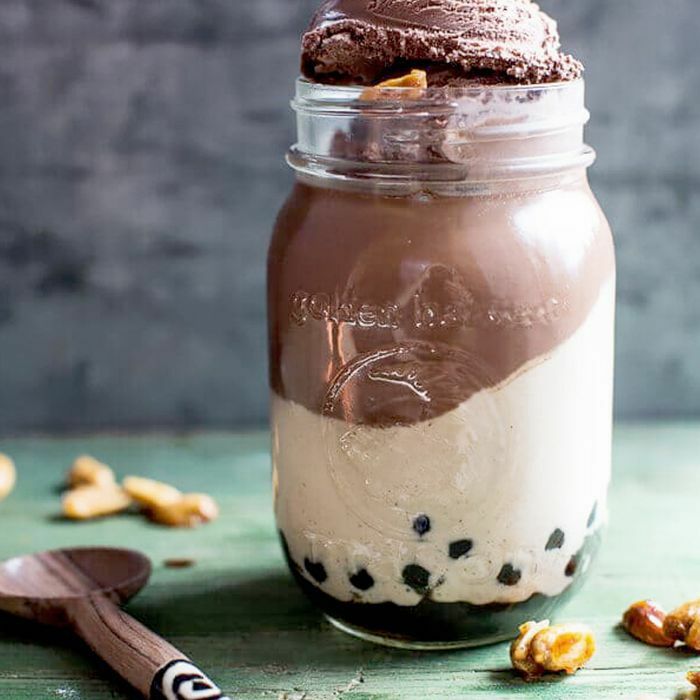 There are boba milk teas, green teas, black teas, smoothies, coffee drinks, and a slew of other preparations that can be enhanced with rich flavors that range from sweet to savory. Milk tea is usually prepared with powdered creamers, although fresh milk is used in some recipes. The boba pearls give the drink its unique taste and texture. Though the pearls may be large or small, the large pearls are most common in U.S.-based boba cafés. The tapioca comes from a cassava root and is a type of starch. These pearls are completely gluten-free and are commonly mixed with brown sugar for flavor, which is how they get their distinctive black coloring. The texture is similar to gummy bears, and the flavor adapts to the drink’s flavor since the pearls absorb the liquid inside the cup. Though there are a few conflicting stories, boba is most commonly believed to have originated in Tainan, Taiwan at Hanlin Teahouse. The owner of the teahouse, Tu Tsong-he, first marketed the drink with white tapioca balls in 1986. Later, he switched to the now-familiar black pearls. By the early 1990s, boba was a sensation throughout East and Southeast Asia. In North America, it first became trendy in neighborhoods with predominantly Asian populations and gradually expanded into a widespread cultural phenomenon. As with most coffee and tea drinks, the nutritional value will depend on the preparation. Many boba drinks are high in sugar, carbs, and calories. If you’re concerned about your waistline or blood sugar, you’ll definitely want to order a small serving or save this treat for special occasions. Tapioca is devoid of beneficial nutrients on its own, but a quality green tea mixture should help you to circumvent some of the guilt. Just bear in mind that even a 16-ounce green tea boba can pack more than 50 grams of carbs, 40 grams of sugar, and about 240 calories. In addition, a 2012 study done by the University Hospital in Aachen, Germany found that boba may contain trace amounts of carcinogens in the form of polychlorinated biphenyls (PCBs). However, some have questioned the results of the study due to the researchers’ lack of transparency in their methodology and because the results haven’t been replicated elsewhere. At this point, the findings should be taken with a grain of salt—or brown sugar, for that matter. While boba may not be the healthiest drink you can choose, it’s certainly delicious and worth the occasional splurge. Curious to learn even more about those mysterious little pearls? Read on to see exactly where tapioca comes from. What Is Tapioca—and Is It Healthy? What Is Kombucha Made of Anyway? What Exactly Is a Latte?